"I would rather not go to Canada; how would I an uneducated dark halfbreed look among the fair and accomplished ladies?" wrote Henrietta Ross Black in 1854 in Red River. We should be crying great toxic tears about what was done. Henrietta is in the Museum of History, at least the webiste, but she's also my great, great grandmother. See my page about upcoming Montreal used book sales with some other bits of book related notes. So I'm trying something different this year, or rather going back to the original concept, headlines to distinct pages of news. Pulse is fun with sweet soul music. I wonder how the sale of McAuslan Breweries will impact the Fringe? RJ Brewers takes full ownership of La Brasserie McAuslan Brewing I was mistaken a few years ago, when I came into the Fringe, it was another beer company, that then suddenly dropped the Fringe about 1999? And then McAuslan became the Big Partner. But apparently they were a sponsor of the Fringe in the early days, something changing before I showed up, or at least took notice. Maybe it's time to try their beer chocolate cake recipe. Some have made a big fuss about the company "owning" the Fringe, but as so many have countered, it's hardly a mega-corporation, and surely Peter McAuslan's place on various board of directors for art and cultural groups is a reflection of his interest, not merely to sell beer. Then in April of 2013, there was another bit about volunteers to the Gazette, Volunteers make the world a better place. Pat Donnelly mentioned that volunteers are crucial to the Fringe in Winning conditions for anglo theatre, which I'm claiming as a result of my work. Art Groups spam, and that's the core of the fuss over Theatre St. Catherine. I just sent a letter to the Gazette about it, posted here with a couple of extra links in place. 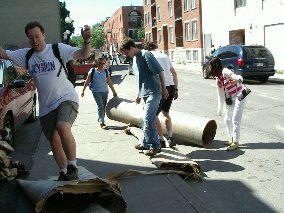 Volunteers hard at work in 2005, putting the Fringe away. It really is lots of fun. I've done it for fourteen years straight, and this will be my 15th. If one of the oldest Fringe Volunteers can do it, so can you.